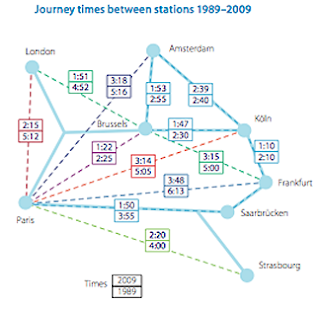 At the present time those dealing with the anticipated growth of the network over the next ten years have not, I suspect, taken into consideration the changing fuel availabilities of the next decade. If, as is a reasonable possibility, crude oil pops over $100 in the next year, thereby drawing increasing attention to the coming of Peak Oil, then it is likely that demand for improved rail traffic will likely rise significantly beyond the 25% increase in growth that has been projected. As I have noted before, trains in Europe are becoming increasingly full, at current rates of demand, even in off-peak hours. In the shorter term, as the report notes, train transport may also be helped by the increasing saturation of existing airports with flights. But it also leads to the problems of using rail to transport goods as well as people. These services have different imperatives, and so the report concludes that two separate systems will evolve. The difference in speed between a (slower) goods train and a high-speed train impacts on rail traffic management for the simple reason that freight trains spend longer on the track and therefore use up more traffic capacity (train paths). This difference in speed may also cause safety problems when these two types of train pass. This makes safeguarding infrastructure availability, while guaranteeing optimum capacity and security, an extremely difficult task. Physically freeing train paths simply means dedicating HSLs solely to passenger traffic and giving freight a higher priority on conventional lines. This is an option being explored by Sweden in particular. They do however expect that, if environmental policies are tightened, that rail traffic as a whole might increase to as high as 420 bpkm for the entire network by 2020, from 189 bpkm in 1999. 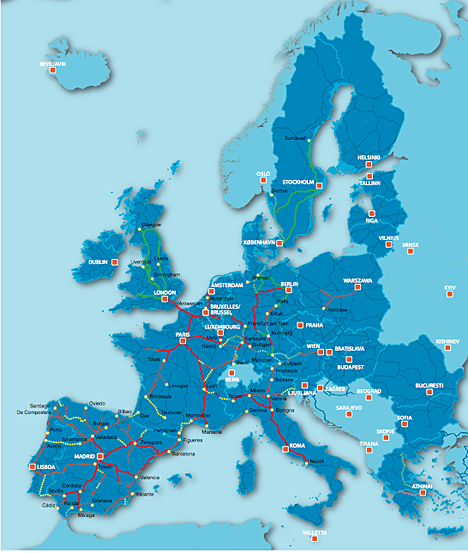 The planned network expansion at present looks to being completed in 2030, at which time it will be at around 20,000 miles of track, and carry 535 bpkm per year, with extensions moving out into Eastern Europe. The initial connection to Russia will be through Finland. The report even looks at the environmental impact of the change in travel mode, since it recognizes that while the trains are electrically powered, that power does not magically appear in the power lines. On the other hand the fate of the investment in a high-speed link in California has not been changed by the election. The backbone of that system, the 500 miles from LA to San Francisco is planned for completion by 2020. (video here). The discussion is more about where the construction will start. It is meaningless to talk about the fuel saving from rail travel without including the fuel costs to build all those miles of road bed and manufacture all those miles of steel rail -- and to maintain them. Europe certainly needs to do something to get freight off their roads and onto more efficient rail, as the US did long ago. But as the article points out, freight and high-speed passenger trains require separate tracks -- which further increases the energy sunk into roadbeds & track. Surely the smart answer is to remove governmental subsidies and remove governmental barriers to construction -- then let the market sort out where rail makes sense and where modern airline transport is more economical? Further, long-range planning should recognize that future higher energy prices are not going to drive airline passengers to rail; higher prices are going to reduce travel. With high energy prices, we will go back to Europe circa 1900, when most people rarely travelled. With the future being so near at hand it looks to be silly at the greatest levels to consider rapid rail. Home commuting, integration by bit and developments along those lines means physical presents will be less and less valuable. Wouldn't 3d presentations be more energy efficient than transporting thousands of tons of empty steel across country? The fact that the USA has minus money period, should put a stop to train dreams. There exists no logical reason to develop rapid rail in the light of the direct business/civilization is evolving. Meanwhile I suggest the automobile is the keenest travel possible for the individual. One of the things that Governments are, arguably, supposed to do is to look into the future and prepare for situations beyond the immediate future and the ability of normal citizens and industry to respond to. I would argue that the coming peaking of oil is one such situation, and that putting in facilities, such as high speed rail, is a sensible way of at least starting to address some of the major problems coming in the years ahead. Our views of the role of Government may, however, differ. HO -- I certainly agree that one of the roles of government should be to look into the future. Unfortunately, we have been stuck with European governments in 1914 and the 1930s that could not see war heading their way; with a Soviet government in 1990 that could not see their central planning collapsing; and with governments today from California to Greece who refuse to see that their Ponzi scheme retirement programs are doomed to collapse because of simple arithmetic. So I don't have much faith in the ability of governments to look into the future effectively. I concur with you that Peak Oil is coming. But long before we get to Peak Oil, we will get to Peak Government. It is time for some humility from those who would rule us: First, Do No Harm! Government today should focus on promoting research and on removing artificial barriers to existing technologies such as nuclear power -- or even unsubsidized high speed trains. If government could do that right, we would have no need for concern about prospering after Peak Oil. Future Coal Supplies - more, not less!